It's the moment you've been waiting for folks! You've waited over three decades to see this Star Wars character return to the big screen and how you've got it! It's only for a brief second, but it's just awesome to see this character will be back. One of the heroes of the Original Star Wars Trilogy, we're more than happy to see this character will represent the Resistance in Episode VII. So give it up folks, for Mr Admiral Ackbar!!!! What, you were expecting Luke Skywalker? Our first third of the spot is mostly things we've seen and heard before, including the "Who are you?/I'm no one" exchange between Rey and who we assume is Maz Kanata. The footage is mostly Rey, Finn and BB-8 in the Jakku desert, but from 0:12-16, we get a glimpse of a very cool action sequence in which our trio escapes from a TIE Fighter attack. TIE Fighters were mostly expendable in the movies, being piloted by nameless stormtrooper drones and all, but I'm not gonna lie, Episode VII has made TIE Fighters look really cool. Call it the First Order effect? Again we've seen this footage, featuring Kylo Ren watching what we assume the First Order's new weapon in action and a First Order stormtrooper attack led by the chrome stormtrooper Captain Phasma, as well as heard Kylo's "Nothing will stand in our way" line (Adam Driver's voice sounds really cool in the role by the way). But we get a new line from Kylo, saying "I will show them the Dark Side". Now JJ Abrams has come out and specifically stated that Kylo is NOT a Sith, though he seems to be pretty knowledgeable on the Dark Side (as well as Darth Vader). Blatantly referencing the Dark Side also shows that Kylo is Force-sensitive, and not just an evil guy wielding a lightsaber (like General Grievous in Revenge of the Sith). After a quick familiar Finn shot, we see a TIE Fighter escaping some sort of First Order hanger. It's obvious that this TIE launch is not exactly schedule as it can be seen wrenching itself away from a cable and stormtroopers are firing at it. Could this be Finn in the shot down TIE Fighter we saw in the Monday Night Football trailer? Familiar images fly be as we get a new bit of dialogue, which feature Finn and Rey introducing themselves. I would be concerned about these two not knowing each other's name during the Jakku escape sequence (which would appear to take place before this scene, which takes place on the Millennium Falcon), but then again, Max and Furiosa went through a good majority of Mad Max: Fury Road without knowing each other's name. 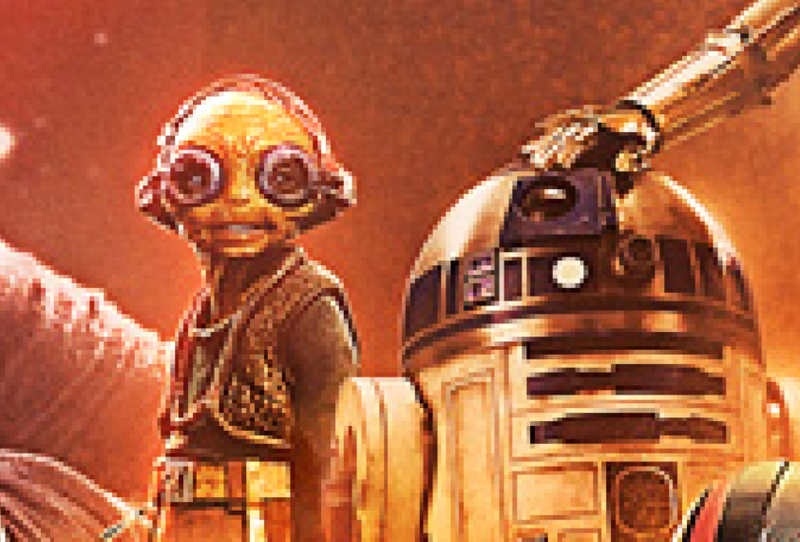 And Mad Max: Fury Road was awesome, so it's OK. Also we get a cute image of BB-8 peeking out. New scene shown between between Han Solo (!) and Rey, in which he hands her a blaster and says "you may need this". Literally passing on the torch! More familiar footage of the Falcon in a dog fighter with TIE Fighters, but a new shot of Rey grabbing her staff and heading into some sort of battle apparently. And there's our favorite declarer of Imperial traps! Admittedly, Ackbar is hard to see, but this freeze frame show his to the far right. I assume this is the new Resistance briefing room, and boy, has it upgraded since the Battle of Yavin! I believe that's Princess General Leia in the middle with her back turned to the camera, while Han stands to her left. C-3PO is also in attendance, to Maybe-Leia's right, complete with the new red arm. Production has been mum as to why the Ewok god has a new crimson claw, but apparently it will be explained in an upcoming comic. I believe the younger looking character standing at the other side of the table is Billie Lourd, Carrie Fisher's daughter who's currently on Scream Queens. Short but very interesting new action shots! Most importantly, we see Finn wielding what is assumed to be Anakin's/Luke's lightsaber in battle against a stormtrooper. The stormtrooper appears to be holding their own, though, thanks to that weapon they have that appears to absorb the lightsaber's blow. And that's definitely not Captain Phasma, so the First Order went all out on new stormtrooper equipment. Shortly after, we get a shot of Han and Chewbacca, guns ablazin'. Han is spry for 73! Our last new footage features X-Wings in action (when everyone else wanted to be a Jedi, I wanted to be an X-Wing pilot) and Rey using her staff against a non-stormtrooper attacker. Sweet! AHHHHHH THE TITLE SCREEN THIS IS REALLY HAPPENING! We also learn that this film is not yet rated. So if you're hoping for an R-rated Star Wars, there's still hope for all 10 of you. For the love of Obi-Wan, is it December yet?